Piles of yarn are stacked outside the show ring and the judge is waiting for the next breed to come in. The Steward calls the numbers and all of a sudden the piles of yarn start moving and magnificent dogs flood the ring. The crowd starts asking: are they large Puli? Smaller Komondor? But the colors and coat are different. Here enters the Bergamasco Sheepdog, an ancient herding breed from the Alpine regions of northern Italy and southern Switzerland. The Bergamasco Sheepdog is a muscular, heavy-boned herding dog with a large head and a thick tail that hangs down to the hock and curves slightly upward at the end. The Bergamasco's characteristic feature is its unique coat, made up of three types of hair which form flocks, strands of hair woven together creating flat layers of felted hair; those flocks cover the dog's body and legs, and can be confused with cords. For a judge, an in-depth manual examination of the dog is imperative in order to discover what hides underneath this magnificent coat. It is important to point out that the Bergamasco Sheepdog is a 2000 year old natural breed, which has evolved with very little human manipulation. 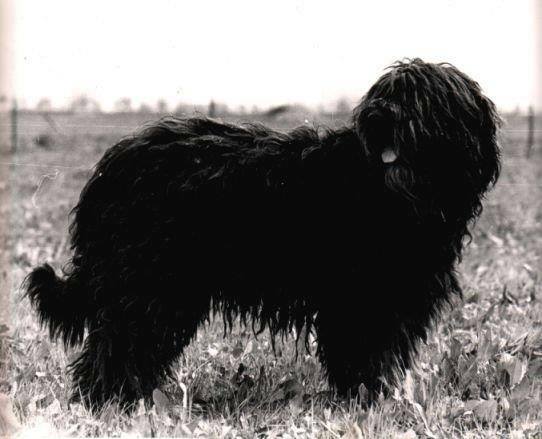 The Bergamasco is a true heritage breed, which developed unique characteristics without man-made aesthetics. - Males ideally stand 23½ inches and females 22 inches (with only +/- 1 inch). The Bergamasco is pretty homogeneous in its size. It is considered a medium size breed, is heavy bones and has a muscular compact built. Some larger and heavier males can be relatively bigger that petite females (85lbs vs 55 lbs). In judging a Bergamasco in conformation shows, one must look for a well-balanced dog with a rustic appearance and with plenty of substance, instead of a cookie cutter image. Males should be masculine and regal, weighing 70 to 84 lbs relative to the height of the dog. Females are more feminine in body with a weight difference in the range of 55lbs to 70 lb. Let’s examine what one should expect while judging this unique breed. The head is long more or less, proportionate to the size of the dog, with the skull and muzzle of equal length, parallel to one another, and joined at a pronounced stop. The skin on the head is tight with no wrinkles. The skull is slightly domed between the ears and rounded at the forehead. The skull is about as wide as it is long, and features a prominent occiput and a marked median furrow. The ears are set high; they are soft and thin and hang down on either side of the face. The ear length does not exceed half the length of the head, and the top two-thirds is triangular in shape, with slightly rounded tips. When the dog is alert, the ears prick up at the base, with the top two-thirds semi-drooping. They are often covered with long flocks at the tip but can also have fringing. The nose is large and black with big, well-opened nostrils. In profile, the nose is on the same line as the top of the muzzle and does not extend beyond the forepart of the muzzle. The eyes are large, oval, and set just slightly obliquely. Eye color is brown, with the darkness of the color varying with the color of the coat from any shade of hazel to dark brown; a lighter eye is not a fault as long as it is not blue. The eye rims are dark and the expression is attentive and calm. The lips are tight and just as the nose and eye rim, of dark pigment. The jaw is wide with a full complement of strong, evenly spaced, white teeth meeting in a scissors bite. The line of the incisors is straight and perpendicular to the outside lines of the jaw. In conformation shows, only the front teeth are examined. The Bergamasco’s neck is strong, slightly arched, and should be about 20 percent shorter than the length of the head, measured from the nape to the forward edge of the withers. The hair on the top of the head consists of primary goat hair and should not be flocked or matted. In action the neck is carried forward with its upper profile almost a continuation of the topline, with only a slight angle at the withers. Dogs should not appear "strung up" in the ring with a high head carriage. A very important structural characteristic, affecting the Bergamasco Sheepdog’s locomotion for optimum efficiency while performing their tasks, is the importance of the length of the body. The Bergamasco is very slightly longer than tall, with the length being about 5 to 6 percent longer than the height at the withers. The Bergamasco should neither be an even square nor too long in body. - If the square dog’s proportions were to be applied to a Bergamasco, the body would be squeezed into unnatural proportions with too short of a pelvis. This would create an insufficient length of the pelvis and its angulations and, in consequence, hind lower limbs too long, inefficient in uphill locomotion, as the dog’s center of gravity would rise. - A longer proportion of 10 to 20% longer than tall is just as incorrect as it would not be suitable for rapid ascent and for downhill. Such build being better suited for sheepdogs who work on flatter terrain covering larger distances instead of using power traction. Bergamascos always carry out their work in mountainous regions so they need a solid and compact build. In order to be most efficient in their environment, which requires work on steep hills, Bergamasco are best built with a difference of 5-6% between the two measurements (body length and height at the withers) without making the dogs any less compact. From a side view, the rib cage is deep but with an almost absent tuck up, and the line of the back inclines very slightly downward from prominent withers to a strong, broad back. The croup is slightly sloping, about 35 to 40 degrees downward from the horizontal. The shoulders are massive and strong; the blades are wide and long with a steep 60 degree angulations from horizontal. A characteristic of the breed is the short humerus. The deltoid muscle and the great dorsal muscle which flex the humerus on the shoulder blade acts with greater power on a short axis. The combination of strong shoulder muscles and short humerus are the best instrument to guarantee resistance and potency for a dog which moves up and downhill where extra effort is required. The similarly shorter length of the radius avoids the lift of the foot further than necessary, to preserve energy and to keep gravity level low. The metacarpus must be short and angled at 80 degrees from the vertical, sometimes giving the impression the dog is slightly bracing when stacked. The abundant hair over the legs and paws can accentuate that impression. At the rear, a broad and well developed Pelvis with 35 to 40 degree angulations from horizontal is essential to support enough muscle mass for an efficient trotter suited for uphill powerful movement. The tibia and femur are roughly the same length (due to axis of the pelvis) and better suited for locomotion over hilly territories. Due to the steeper inclination of the pelvis, the rear extension is lesser than other breeds, as too much angulation would be sign of a shorter pelvis and longer limbs (better suited for flat terrain where speed and stride width are more important than power); the metatarsus is relatively short as well (25% of height). Rear toes pointing outward are not uncommon as they add efficiency in rear traction in uphill movement and are often seen in mountain working breeds. The tail is natural and uncut, thick at the base, and tapering to the tip. When the dog is in repose, the tail just reaches the hock, with the bottom third of the tail forming a hook. In action the tail is often spread out fanwise, and flagging, carried above the back line and in the shape of an arc. It is worthwhile to add a few comments on tail carriage; if the croup is the right length with a correct croup inclination, so that the tail insertion is also on the right spot, a high tail carriage can also be considered a sign of exuberant character. On the other hand, if the croup is too short and the tail is incorrectly inserted, bad tail carriage is a result of a faulty insertion as a result of poor build. The Bergamasco coat is made up of three types of hair: an undercoat, a "goat hair," and a wooly outer coat. - The undercoat is short, dense, and of fine texture. It is oily to the touch and forms a waterproof layer against the skin. - The "goat hair" is long, straight, and rough in texture. - The outer coat is woolly and somewhat finer in texture than the "goat hair." 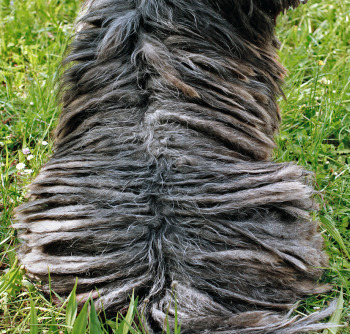 The "goat hair" and outer coat are not distributed evenly over the dog and it is this pattern of distribution that is responsible for the formation of the characteristic flocks (the strands of hair woven together creating flat layers of felted hair). Each flock of hair ranges in width anywhere from one inch to three inches wide on the body. On the back of the body and the legs, the wooly outer coat is abundant and mingles with the reduced quantity of "goat hair" in that region to form wider flocks. The flocks are larger at the base than at the end; they are flat, irregular in shape, and may sometimes open in a fan-shape. The hair on the legs also hangs in flocks rather than feathering. The flocks are NEVER combed out. The hair on the head is mostly "goat hair" but is somewhat less rough in texture and hangs over the eyes. The top of the head should not have flocks and the face should be free of flocks or have only tiny thin strand flocks where the woolier coat mixes in around the neck. A coat that is light around the neck and face with fewer flocks is appropriate if natural. The methods of grooming to achieve this look is a manipulation of the coat and not acceptable in the show ring. For those who have allergies, it is important to note that the Bergamasco's coat is made up of hair, not fur and is considered to be non-shedding. To make it clear, the Bergamasco hair does not cord, (cording is the twisting of curly hair together to create a spiral strand). The Bergamasco coat is very different than that of corded breeds, in that the strands of straight hair weave together creating the flocks. In the Eastern European breeds, such as the Komondor and Puli, the coat consists mainly of curly wooly hair with relatively little goat hair. The opposite is true for the Western European breeds: Briards and Catalonian Sheepdogs, for example, have coats mainly of goat hair. The Bergamasco, from the Alpine region geographically between them, would seem to form a bridge between these two groups with a coat in which both type of hair are presents in almost equal quantities, although straighter and differently distributed. It is hard to say whether this geographic concomitance is a coincidence or whether it has a deeper significance involving climatic and selective factors. The fact remains that the Bergamasco is the only one of these breeds with this distinguished characteristic, which makes the breed particularly interesting from and historical and evolutionary aspect. - The distribution of the various type of hair over the body is not homogeneous. The withers have more goat hair and can have less or lighter flocks, while the rear section of the dogs has a vast amount of wooly hair. Because of this, there is little uniformity in the size and width of the flocks throughout the body as seen in the Komondor and Puli. The coats of the Bergamasco and the Komondor should appear distinctly different. Undercoat very fine, short and oily, that stays next to the skin making a protective, water resistant layer. Goat hair coarse, strong, wiry similar to the goat, stays apart, keeps the woolly coat from twisting. Wooly Coat fine, long and mats together, making the flat flocks. The goat hair is found on the withers and extends back to approx. half of the body. On the back half of the body, chest and legs there is a lot of woolly coat, also some goat hair grows among the woolly coat in these areas. These two types of coats weave together to make what we call today (flocks). - The overall look of the Bergamasco is that of a very rustic breed, the coat should NOT appear Brushed out or overly groomed. 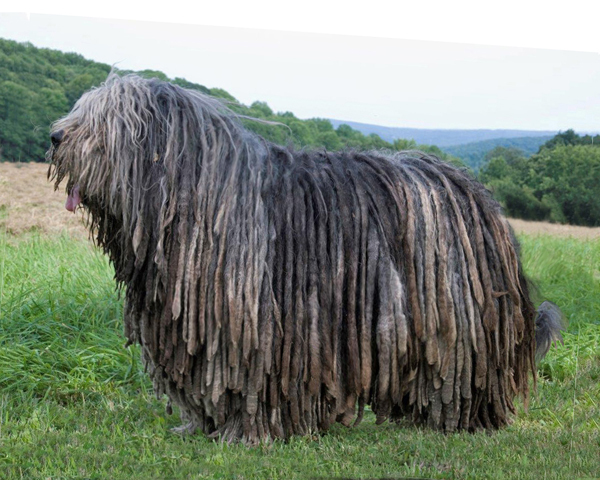 - Contrary to the Puli and Komondor coat (twisted soft wooly and corded), the Bergamasco “flocks” are large, often flat, irregular and sometimes opening fan-wise with fringing at the tips of the flocks. - Because the goat hair is stiffer in texture, it forms wide thick meshes so that the woolly hair weaves through it instead of around itself, creating a woven felted texture. - The top of the head is "flock-free". The head and face ideally are not flocked. Small flocks under the chin and on each side of the muzzle may be present, getting progressively thicker towards the chest. The ears often grow long flocks. A fully flocked head and face should be penalized in the show ring. If the coat looks like that of a Komondor, it is incorrect. - Females may have less coat than male, and often loose their coat after lactation, this should not be considered a fault. The appearance of this coat will remain rustic and will not look manipulated by grooming. The coat may be lighter with missing flocks as pictured above but with a natural pattern and appearance. - Due to the long growth process of the coat, young dogs coat should be appreciated for the stage of their age. - The Bergamasco’s coat should never be shinny nor curly, nor appear overly groomed or brushed out on the body. Only the head, face and tip of tail are acceptable as "flock-free". Bergamascos are born genetically black or merle (black with part of the body diluted into lighter grey). But the color often changes to different shades as the dogs mature. The majority of dogs born black as well as the black patches of the merle dogs will lighten into shades of gray from light to charcoal; a few will remain black. Solid white is not allowed but white markings are acceptable if they cover no more than one-fifth of the body. The color also includes shadings of Isabella and fawn at the lower part of flocks, as a result of discoloration of old hair under the influence of sun, water and atmospheric factors in general as well as ageing of the hair. The loose hairs gradually change color: the grey hairs turn yellowish while the black ones take on a tawny hue. This is what causes the Isabella and fawn shades visible in the coats of adult dogs. If the flocks are lifted up and the hair examined at its roots, close to the skin, the coat must be either gray or black. Bergamascos are seen as mountain sheepdogs; they are built for strength and resistance with well-developed chest and ample thorax, relative short necks with strong muscles. Their type of herding is nomadic in difficult mountainous terrain. - Sheep are timid in nature and tend to bolt when scared, the dog’s job is to keep the upper hand without provoking panic in rough terrain. - When the sheep flock moves, it is slowly with a tendency to disperse. The dogs have to walk along side the flock, moving back and forth with no specific need for great speed. On the contrary, the gait has to be slow and even, requiring great resistance. - When the grazing areas are reach, the dogs have to keep an eye on the flock, so the sheep do not wander too far or run into danger by getting too close to ravines and cliffs. When intervention is indispensable, the dogs need to avoid brusque movements to avoid the sheep to panic with a full stomach or to fall in steep terrain. - At work, the Bergamasco does not walk beside the shepherd, but behind him in order to capture any gesture intended to spur it into action. In the Alps, the Bergamascos had to adapt to various ways of moving the sheep flocks, sometimes covering long distances every day to get to the grazing grounds, while at other times they would only cover short distances within specific areas. Since grass is less abundant than in planes, the sheep have to stay on the move in order to find enough food. As the flocks are to be driven all day long, the Bergamascos cover a considerable distance, and need to be highly resistant. Since the sheep move slowly in mountainous terrain, the dogs have no need for speed; on the contrary, the gait is slower and even. Every action is to be carried out with studied calm. Exuberant or highly strung dogs which bolt too fast or in an uncontrolled manner would have been totally useless for their job and made the shepherd’s work more difficult. The shepherds favor a calmer, better-balanced dog for which speed is only important in rare occasions of sprint, no unpredictable action, but a homogeneous, resistant and regular gait. Note that due to its compact built, the Begamasco’s center of gravity is low and the feet move close to the ground to be most efficient in uphill terrain, while preserving resistance and efficiency. Because of its unique angulations of the fore and hind quarters, the Bergamasco’s movement is very different than other herding breeds who focus more on speed on flat terrain, with a longer extension of the limbs and higher footing off the ground. The Bergamascos gate is more focused on resistance, strength and low gravity with foot closer to the ground. The movement can be slower than other herding dogs. The Bergamasco’s characteristic gait is not always correctly evaluated in the show ring. As a result, handlers with little experience with this breed have developed the bad habit of showing their dogs “strung up in the lead”, forcing them to raise their heads too high and produce a high stepping “flowery” and absolutely a-typical gait. This action much adored by some show competitors, while more “dramatic” and attractive to spectators, is completely unnatural and anti-productive from the point of view of energy waste and uphill efficiency for the built of the Bergamasco Sheepdog. It is important that the Bergamasco’s neck not be too long and that the head not be carried high during movement. The moto: “The longer the step, the better the gait” should not be applied while handling a Bergamasco Sheepdog, and any artificial modification of the movement would prevent judges from appreciating the true qualities which the Bergamascos should possess. Additionally, the Bergamasco sheepdog always works behind the shepherd to watch any hand gesture; therefore, it should be moved beside the handler without too much speed. The correct presentation of a Bergamasco in movement should be with loose lead, a regular and calm speed, feet close to the ground, with the dog side by side or slightly behind the handler, both at the breed or group level. The only gait accepted in the show ring is the trot! The Bergamasco should be able to trot for extended periods of time with ease. Pacing, hopping, leaping and galloping in the show ring should be penalized as the trot should be a natural and effortless gait to maintain on flat ground. Topline should be straight during movement. A roaching topline while gaiting is indicative of poor structure. In conclusion, The Bergamasco is a regal, intelligent sheepdog with a calm, self-assured expression. And don’t forget, an in-depth manual examination is imperative in order to discover the magnificent dog hiding underneath this unique coat. Many faults can be hidden by the layers of the coat. In the beginning, man’s relationship with dogs was limited to hunting but, with the evolution of the human species, stock-breeding is man’s most ancient occupation. By then, dogs were well integrated in human communities and immediately found a place in what can be seen as man’s first step towards civilization. Together with man, the dog became a shepherd. It is now universally accepted that the first centers for domestication of sheep and goats were located in central and southern Asia and spread from this region. Diffusion was mainly due to population groups which emigrated in search of new pastures. Scientists who dedicated their studies to bovine and sheep breeding noted the presence in these same regions of dogs with long, bristly coats. The origins of these breeds probably go back to the Himalayan zones where a wolf with a very thick coat was known “Canis lupus laniger”. From these regions, they then diffused from east to west, settling in mountainous zones along a practically uninterrupted line from the upper planes of Asia to the Alps and the Pyrenees. Along this route there is now a variety of breeds now stabilized and recognized, which are almost certainly direct descendants from a common ancestor. The ancestors of our modern Bergamasco arrived in Italy in the wake of migratory populations, spreading right over the flanks of the Alps and here he survived for centuries and centuries, unchanged due to the in-accessibility of the Alpine region. It was only after the Second World War that industrial expansion and development of tourism caused profound economic changes in life style in the Alpine valleys. Victims of this transition were the flocks together with their dogs. It is interesting to note that around the end of the last century, the dog was still defined by some authors as “Alpine Sheepdog” and sometimes as “Northern Italian Sheepdog” which shows that the name “Bergamasco Sheepdog” is fairly recent. The present name of “Bergamasco Sheepdog” should not be attributed to its place of origin, as commonly assumed, but is more probably linked to the history of the “Traveling Shepherds”. The arid Bergamasco Valleys provided few resources for the inhabitants who were thus forced to seek work elsewhere, assuming tasks which were habitual for them, looking after animals. These were salaried shepherds which took care of the flocks of rich landowners and whose work consisted in driving them to the most suitable pastures. These traveling shepherds, as indicated by the name, moved around following the migratory routes which took them from the high Swiss planes to the shores of rivers in the Po Valley, according to season and requirements. This work was traditionally carried out by people from the Bergamasco Valleys, so that through association with the dogs which always accompanied them as indispensable. It is highly probable that the name "Bergamasco" of the shepherds also became the common name of the dogs. For us, the important thing to remember is that we must not be confused by the name and consider the Bergamasco region as the home territory of the breed. To obtain a Bergamasco Sheepdog, you must not think that you will find it among the shepherds in those mountainous valleys since sheep have long ago become extinct in that region. Industrial expansion and the development of tourism caused profound economic changes in life style in the Alpine valleys. Victims of this transition were the flocks together with their guardian dogs. No longer jealously protected by their shepherd masters, the dogs have gradually disappeared or mongrelized. It is only thanks to the efforts of a few enthusiastic breeders that it has been possible, after a long period of decline, to restore consistency and homogeneity to this Italian breed. In view of its exceptional qualities, it can now compete on equal footing with the best-known foreign breeds. The Bergamasco is a herding/ flock guardian that can work with a shepherd and or tend to a flock on their own and also fended thinking through everyday problems at the same time working with their shepherds to drive sheep from valley to valley through dawn to dusk. The Bergamasco has an understanding of what their needs are and your wants and will do so with their own style. At the same time, they were bred to be gentle and not excitable so as not to disturb the sheep. The BSCA has prepared an indepth study guide for Judges and is available on request.